If you’re unfamiliar with GNSS technology terms, you’ll want to read Tuesday’s post to bring you up to speed for today’s discussion. A key goal at the outset of this blog was to cut through sales jargon and technical jargon and give the ambitious roboticist the knowledge needed to build high quality autopilot systems. Question: if you’re a farmer/surveyor, do you agree with the above statement? If you’re not a farmer or surveyor, or if you haven’t devoted hundreds of hours to RTK GNSS experimentation, you likely didn’t know it was that simple. How Many Satellites Can You See? 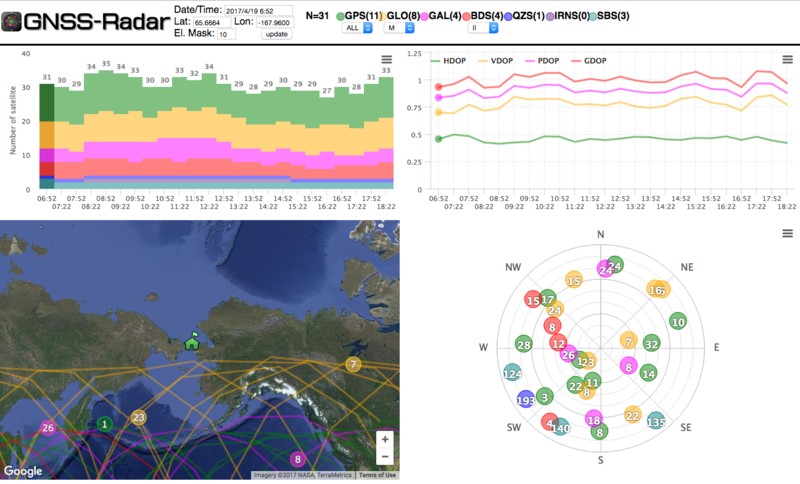 Now, you likely know that the number of GNSS satellites visible varies wildly primarily on your longitude/latitude and secondarily on time. 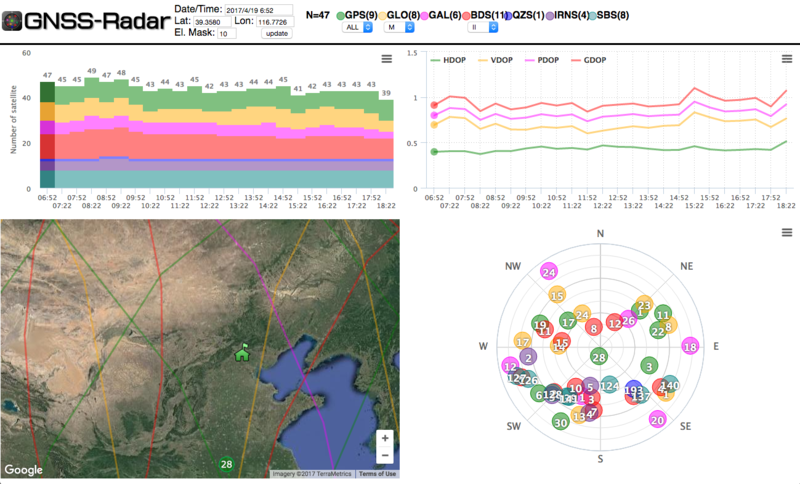 Everyone gets GPS & GLONASS love: BeiDou is nice in the East. If you doubt the graphs above, just review the wikipedia list of GPS satellites and compare the specs of the oldest operational GPS satellite (USA-132 launched 1997) with the most recent GPS satellite (USA-266 launched 2016). Some satellites are more reliable than others, sometimes a satellite gives an invalid reading. A good GPS receiver makes it’s money by quietly taking care of all this (and a lot more) and kindly giving you ultra-precise location readings several times a second. We’ve barely scratched the surface of an introduction to RTK GPS technology. It’s wonderfully fascinating stuff that’s quite complicated. It turns out that over the past 20 or so years, a handful of manufacturers (Trimble, Novatel and Leica are the big ones) have figured out RTK L1/L2 and have managed to keep prices of the components (primarily the receiver boards and the antennas) incredibly high for the small quantity customer. When I say “incredibly high”, common prices I’ve heard for an L1/L2 GPS/GLONASS board are ~$3000 and L1/L2 antenna prices are typically ~$1000. Yeah, you read that right, and consider this: for an RTK setup, you’ll need 2 receivers and 2 antennas. Good luck building that setup with components from the big boys for much less than $10k. Here’s another frustrating part: it’s like pulling teeth to get one of these guys to give you a price for their stuff — it’s almost like they’re uninterested in doing business with anyone who is not an S&P 500 manufacturer. Do you think I’m overstating this odd lack of price information? Here’s a challenge: find 1 URL where either Trimble or Novatel or Leica lists the price ANY L1/L2 GPS/GLONASS receiver or antenna and allows you to purchase said component for said price. Go ahead, find their prices and post them to the comment section. If you google “rtk gps” and you don’t have AdBlock (does anyone actually not use Chrome with AdBlock? ), you’ll likely see Swift Navigation sponsored near the top of results. Of course, what you’ve likely never seen is any kind of independent analysis of their RTK performance compared to a reputable system. Back in 2015 I knew very little about GPS and made a huge blunder by purchasing their Piksi system. I should have heeded the warnings from users in their official forum, but I was itching for really accurate GPS, and no-one had written this guide we’re now presenting. Back then Swift employees would occasionally respond to complaints in the forum with some notion of wonderfully robust GPS upcoming in a software update. Of course, this was before I realized the near gospel truth that all future GNSS technological promises are maddeningly fickle. For a long time I was bitter about wasting $1000 on a totally inept RTK system. But I have to give the Swift guys credit: they were one of the first companies trying to bring high precision GPS to individuals. I assume they employ smart people who were tasked with re-inventing the wheel. Trying to make L1 GPS RTK robust (on really limited hardware, at that) is probably a fool’s errand. Recently they’ve released a new L1/L2 GPS-only receiver that they market as “Hardware-ready for GLONASS…” Interpretation: GPS-only. 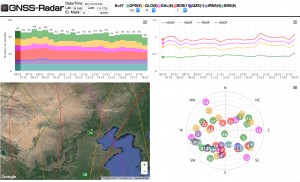 RTKLIB is a set of several open-source applications written by Tomoji Takasu that perform several RTK functions including generating an RTK position from 2 sets of raw GNSS observations (rover and base/corrections). Emlid is a impressive Russian startup with really smart, focused people who have a history of delivering. Emlid, not having millions of VC funding to burn like Swift Navigation, realized that they could take a strong cheap processor (Intel Edison), couple it with a proven L1 GPS/GLONASS receiver capable of omitting raw data (uBlox M8T) and run RTKLIB to provide reasonable RTK results (I haven’t personally tested their product, but their community seems pleased) at a previously unheard-for-RTK price ($570 base/rover kit with antennas). u-blox is a super-solid big Swiss company that makes the de facto standard L1 non-RTK GNSS receiver for drones. For ~$20USD you get an absurdly robust GPS with accuracy around 2 meters. When I say robust, I mean this: I can take a u-blox M8N receiver with a cheap antenna/ground plane inside my house (single story asphalt shingle roof) and if you overlay the results with google maps, it will generally approximate your location WITHIN THE HOUSE! If you guys are inclined to doubt this (I would be if I hadn’t tried it), I may have to recreate this test in a future write-up. 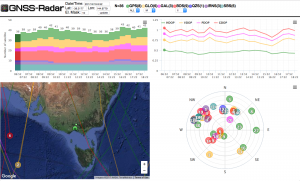 Recently, as u-blox saw an RTK market spring up using their M8T/M8N products with RTKLIB, they decided to jump in on the action. So, u-blox has rolled out their version of an L1 RTK receiver called the M8P. I have not yet used an M8P, but considering u-blox’s history of delivering unquestionably robust products, I assume the M8P is the most solid L1 RTK receiver selling in the hundred-dollar range. If you think about u-blox and EMLID next to each-other, it’s hard to escape this idea: u-blox should acquire EMLID and dominate the L1 RTK market. u-blox is a reliable company with tons of cred and EMLID is a rags-to-riches startup with a quickly-increasing resume of accomplishments. When the average drone builder thinks of u-blox, they think of a great faceless product. EMLID is similar, but with a twist: in the drone community, EMLID has a face and they have serious goodwill. If the big guys at u-blox can iron out the geo-political nuances, an acquisition seems like a wonderful idea. If you’re heavily involved with RTK GNSS, you likely know about BDStar; otherwise, you’ve never heard of them. BDStar is a Chinese technology conglomerate that owns several companies that make proven products. Their two companies that matter for this discussion are Harxon (L1/L2 antennas) and Unicore (L1/L2 receivers). Let’s start with what I haven’t personally used: Unicore L1/L2 receivers. A little story may be in order: back in my early days of RTK GNSS, I had trouble getting quotes for L1/L2 GNSS receivers from Unicore — considering that this mirrored my experience with the North American guys, I shelved communication with them and moved on. In the last few months, however, they’ve been more up front and I’ve got actual quotes for L1/L2 receivers. Specifically, the price I’ve seen for their UB352 (GPS/GLONASS L1/L2 RTK) board is between $450 and $600, depending on order quantity. All anecdotal evidence leads me to believe that Unicore makes a solid board on the level of Comnav/Novatel/Trimble. If you’re new to RTK, that price may seem expensive. If you’ve been on the RTK market for a few years, you realize that this price is an order of magnitude below where it was just a few years ago. The times they are a-changin. Moving back to products I’ve personally used: Harxon antennas. 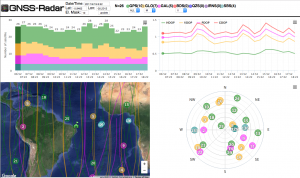 Harxon has a well-earned solid reputation in the L1/L2 GNSS antenna community. They make a great antenna and they stand behind their product. You should be able to pick up a L1/L2 GPS/GLONASS antenna for around $200 — bump up the order quantity and you’ll get that price lower, of course. Perhaps you’ll spare me the time to tell you a personal story about Harxon. I use one of their antennas (specifically the HX-GS481A) on one of our GNSS RTK base stations. At one point the antenna quit working: I’m inclined to believe it was a lightning strike because we get a lot of lightning hits, and the location of the antenna wasn’t shielded from a strike. I contacted Tilen, a sales rep at Harxon, and was really up front — explained the antenna quit working and that it was likely my fault. I really just hoped they would offer to do an inspection on the antenna and give me feedback so I could make future improvements. He promptly replied to my email, said to ship the antenna back to them, and they’d take a look. I shipped the antenna to China, and within 2 weeks they had delivered a brand new replacement to my front door. To wrap up the story, I haven’t heard if they’ve confirmed that it was a lightning strike, but the fact that they, at considerable expense, quickly shipped a replacement to me on an issue that was likely my fault was eye opening. I have never heard anyone have any other problem with a Harxon antenna, and I’ve only heard good reviews about doing business with them. If you’re looking to source proven L1/L2 GPS/GLONASS antennas from a company who’ll stand behind their products, you should seriously consider contacting Tilen at Harxon (sales@harxon.com). In our little foray into bringing that which is hidden into the light, we’ve saved the best for last: ComNav Technology / SinoGNSS. ComNav is a proven Chinese L1/L2 GNSS receiver manufacturer that operates under the SinoGNSS brand in the North American market. I’ll start by giving you the Cliffs Notes: ComNav’s K501g receiver is an absurdly good board at a market-changing price ($600-$900 last year in small quantity, unsure of current prices) that effectively solves RTK GNSS for off-road precision navigation applications. Another personal story is in order. Regular readers know that I spent a decade writing software at NASA before venturing back home to the deep south and starting up a robotics and software shop. When I began working with outdoor navigation (you know, in the real world where trees, buildings, and powerlines exist), it quickly became clear that the L1 RTK systems marketed at that time were a joke. So, in a quest to get a reliable system, I started with the North American guys, with limited success mentioned above. Upon hearing about ComNav, I contacted their sales department and a guy named Andy quickly responded and without much wrangling, gave me a quote on L1/L2 GPS/GLONASS sample base/rover system for development (K501g receivers, antennas, wires, dev boards, USB adapters, etc). We’re talking about over $2k worth of components. With much trepidation I wired the money to China, and to my great relief, within a few days the system showed up at my front door. Not long after that, I had configured the base & rover feeding into a Pixhawk autopilot, and the RTK results were seriously solid and reliable. If you’ve never seen one of these systems in action, it’s precision and resilience, even in tough conditions (trees, obstructions, etc), is something to behold. ComNav/SinoGNSS backed up every promise they made. You don’t have to be a S&P 500 company to get a fair quote from them — and they won’t harass you or pressure you to buy their products. If you’re looking to build the kind of system we’re building, you should consider dropping a line to Andy at ComNav (sales@comnavtech.com). I knew when I started this blog that I’d have to write this article. I don’t like criticizing anyone and would have preferred to write without mentioning any companies in anything less than a flattering light. But here’s the rub with that approach: if this blog motivates you to get really involved in path-following outdoor robotics, you’ll soon want a strong performing RTK GPS. For whatever reason, I have not found ONE ARTICLE ANYWHERE ON THE ENTIRE INTERNET explaining what is presented above. Without this knowledge, you’re at the mercy of advertisers and salesmen — of course this is not the position you want to be in. Our goal in this humble blog is to shine light on every important piece of knowledge you need to build a high quality, large-scale navigation robot. Today we took an important step: we began pulling back the veil of pricing secrecy and marketing jargon that has kept individual roboticists and small robotics companies from using world-class GPS technology. Next time let’s get back to the Rover 2 build. 1. Roby can’t overemphasize that he has no personal experience testing RTK systems outside the southeast USA — BDS looks very promising, Galileo may be good. The future of Galileo, as a European Union project, feels like a proxy bet on the future of the European Union — considering the events of the last few years (Greece/Brexit), it’s success may not be a foregone conclusion. Swift Navigation contacted me the day this article was published and offered a complete refund for the Piksi purchase. Additionally they apologized for my experience with the Piksi. This was a super classy move, especially considering that we were really tough on them in this article. I want to state again: the engineers at Swift are attempting to solve a huge problem (of course, precision positioning is already solved by Novatel, Trimble, etc — but Swift seems unique in acknowledging that small-time robot builders exist). 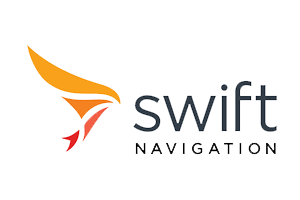 If Swift is able to build a product that can hang with ComNav or Novatel, I will likely write so many articles extolling their praises that you guys will get sick of reading about them. IMO a large part of robotics fans can avoid to spent 2k $ for a L1/L2 RTK system , as far as I know in 10km range from base the precision of a L1 RTK system like UBLOX M8P is very similar . The real difference is that with M8P you do not have raw gps datas . I bought the Drotek M8P and with 600 $ you have a light and fully Pixhawk integrated system with a 2 – 3 cm precision . I did not trust small companies but I trusted Ublox . Thanks lucmaxi. I’ve loosely followed the Drotek guys and they seem to have a good reputation. Can you speak to the resilience of the M8P in difficult environments (tree canopy, buildings, etc)? Also, how about the RTK fix times and re-acquisition time after RTK loss? I do not have anymore the Drotek RTk since I deliver the multirotor to my customer. Anyway since I have started a project for an autonomous mower I will have to deal with trees canopy . The solution for difficult environments IMO would be to adopt a second GPS with dead reckoning features. I am working on the similar project, Would you be able to help on some configuration. We can discuss on compensation. Thank you so much for this fantastic article. I really enjoined reading it and found it most helpful. I was very nearly on the Trimble road, almost ready to place an order to them. I just must try the ComNav. May I ask, do you have any blogs or guides on using the K501g reviver with Ardupilot? Unfortunately whilst there is some documentation for other solutions, I see nothing for the ComNav. 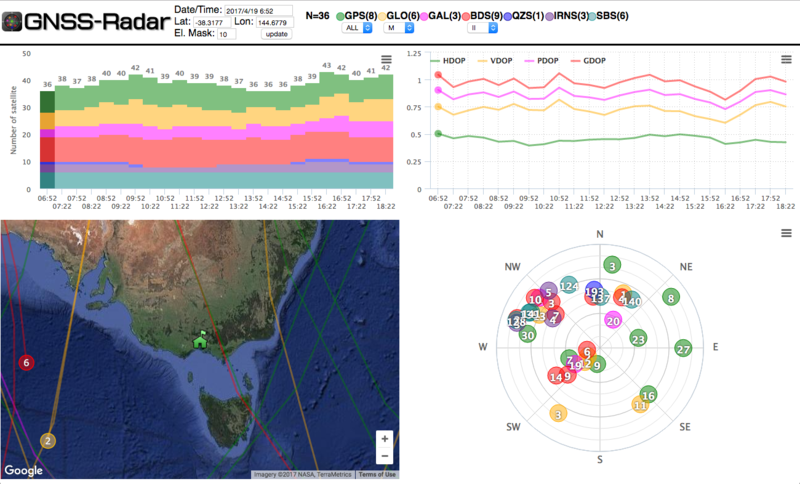 You’re in luck with Ardupilot because it rolls ComNav support (via Novatel commands) via the NOVA GPS driver (https://github.com/ArduPilot/ardupilot/blob/master/libraries/AP_GPS/AP_GPS_NOVA.cpp) That driver works great — big props to Michael Oborne from Australia (https://github.com/meee1). The way it works is this: ComNav was smart and their boards support the Novatel standard commands out of the box. Hardware-wise the k501g uses the standard 20pin 2.0mm connector (https://goo.gl/tCsglw) for serial input/output and the antenna connector is standard MCX — you’d use something like https://goo.gl/DBc5cD to connect it to a standard L1/L2 TNC antenna. Be advised: there is some configuration to get a board working as either a rover or a base. If enough people are interested, I may need to do a write-up on setting up the k501g start to finish. We’ve used Pixhawk/Ardupilot pretty extensively with the k501g (in difficult enviroment with highly obstructed views of the sky) I can tell you it’s a wonderfully robust and precise solution. If you go read the precision ag farmers and surveyors, they all rave about L1/L2 GPS/GLONASS RTK — there’s a reason for that — it’s absurdly awesome stuff. Here’s hoping you’re able to score a good board and report back the results! Hi Roby – I have been trying to integrate a K708 from CommNav without much success. What was the config string you used for the K501 and which comm port did you use? Any assistance would be appreciated. I’m really excited that a man with a K708 has found this blog — I’ve been wanting an independent review of the higher-end boards. OK, first things first — how far have you made it configuring the K708? Do you have a dev kit for easily hooking it up to a computer? Have you had success with the “Compass Receiver Utility” software? The K501 has 3 ports — I believe that any of them can be used for configuring — but you have to instruct the board to put the respective port in “configuration” mode (as opposed to “receive corrections” mode or “output PVT” mode) — Hey, these 3 modes are just what I’m calling them — don’t have the docs in front of me. Of course, to be able to send commands to the board, you have to successfully establish connection on one of the ports (this involved getting the baud rate right: TIP — commit to a baud rate, ANY BAUD RATE (perhaps 115200), and set THAT SAME BAUD RATE for all ports on the board — this will save you much headache unless you just magically remember all 3 ports and their respective baud rates). Let’s follow up and get the K708 running — I think with a little troubleshooting we’ll get it. I have the dev board and we have it working with compass however cannot get it to talk to the pixhawk with Novotel. I got it working out of the dev board with an rs232 level shifter however nothing straight from board to the controller. I used the config string from the driver code. Think we have a signal conditioning problem or the board is fried. Thank you for posting very interesting info out there. It helps a lot. I have a question (and a doubt) about the real advantage of using two frequencies L1/L2 instead of the much cheaper systems using just L1 in terms of effective end results. Yes you might have a faster acquisition time, but does that really matter in most real applications to wait a couple of minutes before launching your drone or starting your automated tractor to mow grass during a few hours, or to make your ground durvey ? I’m being provocative here but I’d like to hear opposite arguments ? If you’re flying a drone with an unobstructed view of the sky, you may get really good performance from the L1 RTK systems. On the other hand, we build outdoor precision navigation robots that have to contend with tall trees, buildings, powerlines, airplanes and flying squirrels. I’ve never seen any independent party post a review of an L1 RTK system reliably holding a fix in these kinds of conditions. Hey, regardless of whether the L1-only guys can make a robust solution, they’ve undoubtably made our life as roboticists better by disrupting the frothy market that the L1/L2 Big Boys had enjoyed for decades. I use Emlid’s RTK system for (not so serious) topographic survey works. I have never tried L1/L2 combination and would love to see the performance comparison under such conditions. Thank you so much for such an informative article you have written. Android’s gnssmeasurement class gives RTK on your phone alone [with connection to CORS]. Been waiting six months but still nothing developed yet! – nett cost to be $0 if you have a phone already. I’d be impressed if a smart phone could approach u-blox M8N NON-RTK performance. 4) – alignment of the waveforms to give the point in the wave cycle which takes it down to 1 picosecond (3 mm). Then it is a matter of how good your errors have been identified and fixed in your calculation! Rather than 1 bit every 1500 waves wireless devices are utilizing phase changes 4 or 8 times in one single wave. Once a method is devised (say using 2 channels for one frequency, one 180° phase shifted) that id’s the actual wave when a bit changes we have cm accuracy. Hi Glenn! Somehow I think I lost context on this one! 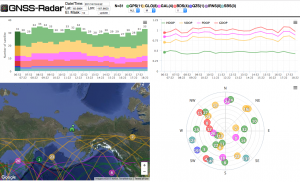 Have you looked into the Tersus GNSS start-up? They are triple constellation and may be worth checking out. You’re going to get me in more trouble. When writing up this article, I thought about sharing my experience with Tersus, but barely vetoed it and decided to let it go unless someone asked. Placed order for their “Precis-BX305” system on May 30, 2016. Tersus sent an email saying they would ship my order June 10, 2016. Roby doesn’t hear from Tersus for 4+ weeks, so he sends multiple emails asking what’s up, and asking to cancel order — silence from Tersus. July 11, Roby disputes charge on Credit Card and cancels order — Tersus folks quickly call and ask me to reconsider, but at this point trust was gone. Roby loses no money, just a little headache. It appears that Tersus is using the Unicore board. Actually, I’m quite sure of that, everything hereafter is increasing levels of speculation. So Tersus (a tiny startup — I’d be shocked if they’ve got more than a few folks) saw the same thing Emlid and Drotek saw back in 2015/2016 and they decided to try to be Emlid for the L1/L2 market. So somehow they thought they had a deal with Unicore to buy boards outputting raw L1/L2 measurements (Unicore agreed to sell the boards for fairly cheap with raw measurements but WITHOUT Unicore’s proprietary RTK algorithm — Unicore knows how hard it is to get a stable RTK algorithm, and they knew Tersus wouldn’t be actual competition for a long time). So, Tersus thought they had Unicore’s boards and they thought that they’d make a few tweaks to RTKLib and have something they could claim as L1/L2 RTK. But…somewhere in that whole string of events something went wrong for Tersus, and they couldn’t deliver what they’d marketed. I had decided to hold off on mentioning them (unless asked) because I feel for those guys. They probably make 1/10 $$ what you and I do and they probably are working 80 hours a week. I respect anyone who’s actually trying to innovate — on that level I respect the Swift guys too. If either Tersus or Swift ever deliver a board that will hang with ComNav, I will shout their praises from the rooftops. One more thing: if any Tersus folks are reading this and would like to dispute/clarify anything I’ve said, just reply in the comments and I will publish your reply VERBATIM. I respect what you guys are trying to do and hope you can accomplish it. Interesting indeed, a little communication goes along way. I have self-teaching OEM board integration in spare time utilizing the Hemisphere boards, I really like their Athena engine but the product is not at the lowest price point nor designed (entirely) in China. Hi Roby, this is Nick Zhu from Tersus GNSS Inc. I found this article on DIY Drones. We’re very sorry about your case. Tersus did face the some problem at that time, which cased the delay for your order. We are always in a responsible manner to our clients and must delivery the qualified products, which can pass all our tests. I fell sorry for the unacceptable manner that our sales department couldn’t reply your email in time. Please accept my apologize. We are trying to innovate. Facing a lot of technical issues and solving problems is our daily work. Our mission is to share our achievement in GNSS technology with more users. It is a long and a tough way, but we chose to go and we must go. I have some knowledge about GNSS. If you don’t mind, please drop me an email or add me on Linkedin. Hope we can share experience with each other. Great intro to commercial RTK systems for the beginner! Anyone wanting to learn this stuff would burn hours upon hours of internet research and still not get good answers. Bravo! 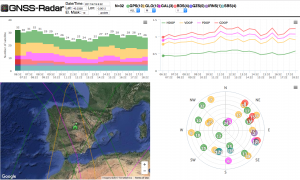 I can comment on my experience with Emlid Reach RTK. I decided to go with them because the price is reasonable, Intel Edison running RTKLIB is impressive, on board IMU, built-in Wifi/BT. 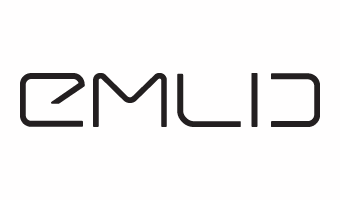 I have been very pleased with the online forum community and the support from Emlid developers answering questions. Am currently testing a Reach rover unit receiving TCP corrections from a CORS ~ 15 km away. I was able to get fixed solution with 6 – 8 sats last night in my yard which is not an open field. With no additional hardware, it can pull the TCP corrections down from home wifi or a mobile hotspot. I haven’t tried this yet, but they claim that the included USB OTG can power a cellular modem for portable applications. I really like being able to connect into the Reach with its own Wifi network so any phone, tablet, etc can see it. I have one negative thing to say about Emlid’s Reach so far. They promote the on-board IMU on the website and one would assume this would work out of the box. But it does not, or at least not easily. They are planning to develop output of the IMU data in the App in the future. But right now, it requires a hack to get to that data. They really need to do better on that if they are going to advertise it. For just under $300 and a public CORS correction, its a pretty good option IMO. Thanks Golfman! Hey, I hope you’ll keep us posted on the Reach evaluation — impressed you got a fix at 15km baseline with L1. One problem with the Reach approach is the Edison is export restricted. So wherever you want to take/ship your system you need permission from the ITAR folks in the US. 1. I need second K501g with AT300 which will be base, connect that base to NTRIP system (in my country there is paid system ASG-EUPOS who send corrections via internet in RTCM 3.1 format) and then the base will exactly know where it is to subcentimeter precision. Then it could send corrections to the rover. 2. I don’t need my own base station and I’m connecting my rover directly to NTRIP system and it receives corrections from NTRIP all the time. Are these two option possible? Which one are you using? I would like to know the details I mean how can I connect two K501g with each other (radio?) or how can i connect K501g with NTRIP system which requires internet. 1. Are you using ArudPilot/Pixhawk for the autopilot? If so, everything just got a lot easier (at least for me to help ya’). 2. If you tell Andy @ ComNav you need a dev board, cables, USB adapters, antenna, etc — he’ll make sure you get all the hardware you need. D. A connection from the card’s 20 pin bank to your computer. 3. Now, if you’re not familiar with this equipment, I just made you more frustrated by not giving pictures and human-friendly explanations. My commitement to you is to do a write-up on using the k501g within 10 days. Andy will advise you to buy a “dev board” for the K501g — you’re advised to pick this up as you’ll likely find this makes using the K501g easier for the beginner. 4. I have no idea how reliable ASG-EUPOS corrections are. You may do fine using those. If you can afford it, I HIGHLY recommend picking up a second K501G (and a second antenna/dev board/etc) to use for corrections. MONEY SAVING TIP: tell Andy you want to buy a second K501G WITHOUT RTK — just outputting raw L1/L2 GPS/GLONASS observations @ 1HZ. I think you’ll find that he’ll make you a slick deal on that card. Sorry if you wanted it to be more complicated than that, it’s just relaying a stream of data. Oh, ComNav gives you a Windows app (called “Compass Receiver Utility”) so that you just specfiy the URL from A and it routes the corrections to your card. Similar functionality exists in Mission Planner. 6. I’ve used both public corrections and our own — I like using my own — no baseline and, well, I just seem to have great success with it. Ok, did that help out? This post has generated a good bit of discussion — I will be following up shortly with a “NO Experience with RTK – to – RTK Fix” tutorial for using the ComNav k501g. Hello! Thanks for the detailed answer. 2. Now I see that there’s no support or any community for k501g board on the entire internet, for emild there is nice community. I’m thinking now of choosing emild reach kit, or reach rs + reach, but it is only L1. Will it be enough for me to use it on boat on lakes? Can you advice me if it is better to me: to choose commnav l1/l2 and spend a lot of time figuring it out and having l1/l2 or to buy cheaper emild which is plug&play but only has L1? What L1/L2 gives me comparing to only L1? 2. Andy from CommNav suggests me to use two T300’s for rover and base, have you ever used them? I guess it will be much much more expensive solution. 1. I have *NO EXPERIENCE* on lakes. Signal “multipath” is the big enemy fighting GNSS. For land rovers, signal multipath usually comes from obstacles BETWEEN the antenna and the satellites in the sky. In contrast, for your application, the big source of signal mutlipath will likely be REFLECTION OFF THE WATER. So, the easiest solution for signal multipath for a water-bound rover is a BIG GROUND PLANE. Come to think of it, when you see GPS antennas on boats, they look like they’re 1 meter wide — I’m guessing that’s b/c they need a big ground plane (and the super expensive antennas use some version of a Choke Ring — “Choke Ring” sounds like a signature American Wrestling move, but it’s not). 2. 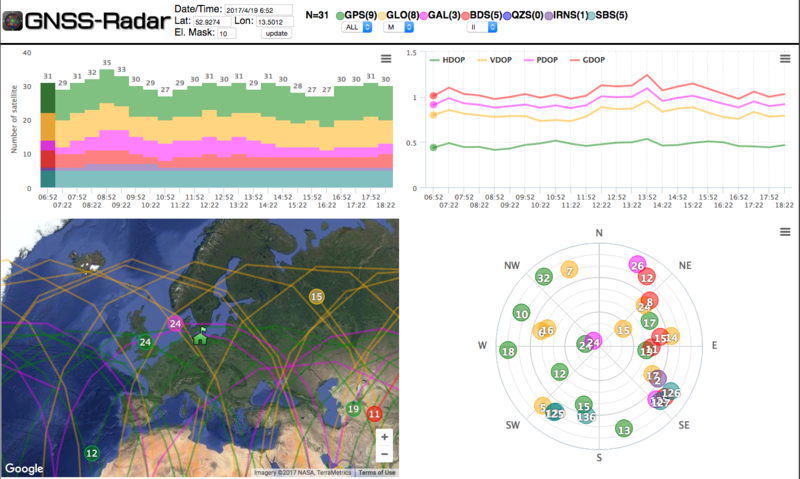 Unless you know that you need L1/L2 GNSS (for the reasons described above) — you may not need it. If I had to bet, I’d think that L1 GNSS RTK out on the water with a good antenna (antennas are very important) would likely be a good solution. Potential problem is distance from corrections source: L1/L2 systems often can go 50km from corrections source (this is called the “baseline”) — L1 systems may get 10km or 15km. AFAIK, the ComNav antennas are just rebranded Harxon antennas — as such, they are awesome. 3. If I were you, I’d look into the M8P in addition to the Emlid (M8T) solution. The PixHawk community has a somewhat standard implementation of the M8P called Here+ (http://ardupilot.org/copter/docs/common-here-plus-gps.html). Out of curiosity, what kind of project are you doing that requires RTK out on the water? Thanks for your reply! I will do some research with local field surveyor’s if L1 will be enough for my purpose. One more important question to you: Is it possible to easily integrate a 3rd party RTK equipment for example Trimble RTK GNSS with pixhawk? Emild’s for it’s reach provides a library to do that, Here+ with M8P is already integrated with pixhawk but will it be hard to integrate trimble rtk receiver with pixhawk? Im doing an usv boat for lake’s surveying. No idea about Trimble and Pixhawk. If you have access to a Trimble, of course, you’re a lucky man. i’ve got a few questions and hoping you (or one of the lovelly readers here could help with). i have a 3dr Solo that i have updated with the M8P RTK GPS unit from Drotek, i havent got a base GPS yet because i’ve been trying to get one thats useable with another UAV i’m going to build, My original idea was to get the HERE+ RTK systems as i could use the base station from that with my solo or my second UAV using RTK injection with Mission Planner. If I was to go for two K501g boards, one set as rover on the second UAV, and one as the base station, would it (the base station) work with the M8P GPS on the 3dr Solo? either by sendding correction data for realtime correction or using it as a dataset for PPK? If I were you, and I had an M8P, I’d be looking to buy another M8P as a base station for testing RTK before making the jump up to L1/L2. 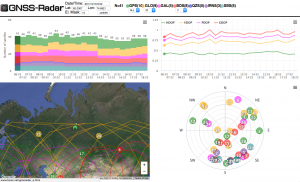 If you’re up in the air, you may get a reliable RTK fix with a L1 multi-constellation system like the M8P. I hope to be able to test an M8P soon, but I have not yet tested them. Anecdotally, the M8P seems to be the best regarded L1 system. Looking at the M8P docs, they accept the standard “RTCM” correction messages — so, if you live close (say, within 10 km) to a public base station (in the USA there are many public stations: http://gpsworld.com/finally-a-list-of-public-rtk-base-stations-in-the-u-s/), and if you have a way to stream those corrections to your M8P, you might have success going that route. Does that help? Whichever way you go, I’d like to know if you have success with the M8P. Awesome post! Seriously, the best single source I have seen comparing “mass market” RTK. Your conclusions are right in line with my own year-long information quest (but for the grace of GOD, I too would have a pair of Piksi boards gathering dust). Thanks so much for introducing me to ComNav and BDStar family — those are intriguing solutions and new to me. We are now working on our first RTK real world app with the uBlox M8P. The module looks good but the C94-M8P eval board is turning out to be frustrating to integrate. If M8P can “consume” L1/L2 resolution data — do you think it might be possible to construct a system with (say) a ComNav L1/L2 base board and antenna, providing L1/L2 correction to an M8P rover, and thereby deliver L1/L2 performance at a lower cost? Even when the rover’s hardware doesn’t “implement” L1/L2 itself? I realize I may be showing my ignorance here. Thanks again for sharing your hard work for our benefit! Just briefly scanned those docs, and here’s my NON-RTCM-EXPERT interpretation of what that means: you can feed the M8P the standard L1/L2 RTCM3 stream and the M8P will take the information it needs from it (specifically, the L1 satellite information). In other words, u-blox is making your life easier — just give them the standard stream you can get from thousands of public base stations (see link in comment above for list public USA stations), and they’ll parse it and take the data they need. Now, if you find out that, in fact, the M8P somehow uses the L2 information to it’s advantage, by all means let us know! I’m really excited to try the M8P — bummed that you’re having headaches with the dev kit. Don’t feel bad, basically the only community of people who really know this stuff are Surveyors. We’re all just figuring out stuff those guys knew 10 years ago. Such is the life of a robot builder! Thanks for the wonderful article, it’s really useful. I want to install an RTK GPS on a car for 3D mapping purposes and i need it to be as accurate as possible. I have budget of $2000- $2500 for two rovers. I want to use the public CORS network in my state using NTRIP protocol to save money and the headache of transferring correction over the Internet. The closest CORS station is 17 Km away, is that close or I shroud consider build my own station?. I have talked with SwiftNavi and they are still working on supporting RTCM on their Piksi Multi and as you said it only supports GPS for now. I contacted Tersus-GNSS too but after reading your experience, I do not want to do any business with them. U-blox seems very solid company but they only have L1 GPS receivers. Any recommendations? It all depends on how solid you want your RTK solution to be. If you’re in an open area, and if you don’t mind waiting a few extra minutes for RTK to initialize, then you may do fine with the M8P. Since writing this article, I’ve heard from several folks who have used the M8P and are very pleased with it (every day I fight an ENORMOUS TEMPTATION to buy the M8P eval kit: https://www.u-blox.com/en/product/c94-m8p). I’ve also recently had a chance to test the Emlid Reach, and it is far superior to the previous L1 RTK consumer solutions. As expected, both u-blox and Emlid continue to deliver. But keep in mind that no current L1 solution is anywhere near as robust as an L1/L2 solution. Specifically, just a few minutes ago I fired up the ComNav k501g IN MY HOUSE (asphalt shingle roof), and it held an RTK fix with +- 1cm variance for several minutes — overlaid the results with Google Maps and it was precisely showing the rover rolling around the house. I was so blown away that I had to get Mrs. Roby to come see the RTK results — she acted impressed but I don’t think she really cares. My point is this: you’ve got to figure out how robust of a RTK solution you want. You can build a legit L1/L2 GPS/GLONASS system for $2k or a legit L1 system for $500. Both of those options are massively cheaper than just a few years ago. As far as accuracy/precision: if you have a RTK fix, I think L1 solutions are just as precise as L1/L2 solutions. In other words, if you’re going to be in open areas where you’ll always have a fix, a L1-only solution would theoretically give you data just as precise as a L1/L2 solution. To your question about baseline: for L1/L2 17km is easy. For L1, that’s stretching the recommended limit. Best wishes with your project — once you get a good RTK system running, I think you’re going to hooked. Thanks for the information. I’m planning to test it in university campus, so, L1 is not very reliable solution for me. I’m planning to Integrate it with ROS too. I managed to secure $5000 for my GPS project for one GPS unit. Do you recommend any product that is not Chinese? AFAIK most GNSS products are manufactured in China/Taiwan. I’m looking at a Garmin GA38 antenna as I write this and it’s made in Taiwan. Are you sure you only want 1 unit? I think you’ll find that having your own base station is a huge advantage. I don’t know what any of the North American distributors would quote presently for a L1/L2 GPS/GLONASS 10hz system (assuming 10hz is enough — you may want more if you’re driving in a car). If you do get quotes from these guys, I’d like to know what numbers you hear. Sorry for the delay. I have two projects that i’m working on; one requires a reliable high precision GNSS with a budget of around 5k-6k for one unit and my second project has a limited budget of 1k for two units. Regarding the first project i got these quotes . Flexpak6 deal-frequency for around $6000 w/o antenna, Speptentrio AsteRx-m-c kit for $4500 w/o antenna and hemisphere smart antenna kit for $4500 ( is this a reliable company?). For my second project, i was wondering which GNSS has the best performance Emlid Reach or ublox M8P both are close in price. 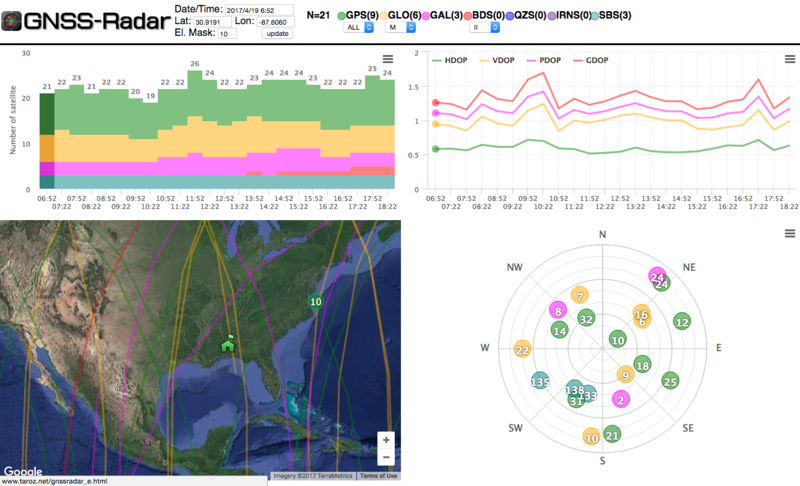 Emlid also uses ublox GPS so it kinda difficult to compare. I believe state CORS equipment is much more accurate and reliable than any sub $10k GNSS base station i can afford. So i want to rely on public CORS. unfortunately all the Chinese manufactures that you mentioned in your article don’t have a USA branches that is why i can do business with them. Do you have any comment on this article https://nimbus.unl.edu/2016/09/evaluating-rtk-gps-for-uav/. I believe the minimum SNR/satellite are very important ? This past weekend I spent a good bit of time with the u-box M8P eval kit. Expectations were both high because u-blox has made great products for years and low because of previous L1 RTK experience. The M8P managed to significantly exceed my expectations. There are scenarios where it can’t hang with the L1/L2 systems (fix times, fix in highly obstructed/difficult scenarios) — but there are many scenarios where it’s an entirely legit RTK solution. Particularly impressive is that the float-to-fix solution hop (when it jumps from float to fix) only deviates 5cm or so, in my experience. My previous experience with affordable L1 solutions was that the float-to-fix jump was on the order of 1 meter. At this point, I don’t know a reason to evaluate any L1 system before trying the $399 M8P eval kit. It’s actually a refined eval kit with clear instructions and the u-center software is fairly nice. As for the brands you mentioned, I have little experience with them — but those guys are all known for making great products. I have heard of Hemisphere, have known people who use their products — they are legit. Keep in mind Javad and Trimble while you’re getting quotes. Also, keep in mind that you’re starting to see USA-based L1/L2 antennas popping up on eBay for ~200USD (no need to haggle with manufacturers via Alibaba). Another thank you for writing this. I have sent emails to Harxon and Comnavtech requesting quotes. I own Pixhawk 2, 3DR radios and Emlid Reach equipment, but have struggled to translate the available documentation into a working solution. Just using the web interface with Reach the performance seems to be 1 meter stability on a partially cloudy day so I’m hoping the K501G will do better. The rover is a 50 hp farm tractor. The bad news is that the k501g doesn’t have near the hobbyist community of the Emlid Reach. Actually, I think this single page is presently ComNav’s entire hobbyist community. However, I suspect that more folks will be relaying raving reviews like mine in the near future. The pearl that is ComNav will only stay hidden so long. The good news is that the k501g is not a hobbyist card. It’s a professional, robust L1/L2 GNSS card that will put tremendous pressure on Novatel/Trimble/Javad for the near-future L1/L2 RTK robotics market. 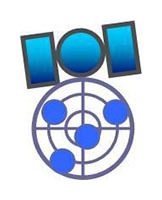 ComNav does publish thorough documentation for the card (http://www.comnavtech.com/download.asp?bigclassid=27). If you’re not very familiar with RTK systems and terminology, you likely won’t find that documentation as approachable as you’d like. But, if you can spend the time to understand the documentation & the card, I think you’re going to be really impressed with the RTK results you’ll receive. I do use the 3DR radios for sending corrections from my base station to the rover. Basically, I’ve got one radio that’s dedicated just to receiving corrections from the base station, and then it relays the data along to the rover’s k501g card. I’m working on some really basic documentation for using the k501g in an autonomous rover application. Hope to publish soon. Included will be my base station setup — spoiler — it’s just a python script that reads data from a local k501g card and relays across the 3DR radios to the rover. Again, if you don’t have a lot of experience with RTK systems, there’s a lot of terminology (base stations, corrections, RTCM formats, etc) that can be cleared up with a good tutorial (with pictures) of setting up a base station & rover system. Hopefully we’ll get this tutorial published soon. Andy at ComNav replied. $3,300 for 2 antennae, 2 K501G OEM boards and 2 interface boards. Thanks, Roby. Very helpful and the comments have been awesome too. I hear you about pricing – it’s very frustrating. I’ve found some pricing on GPS systems and antenna by Googling for the item and the word, “cost” or “price” but that fails more often than not. Don’t know the current market prices for choke ring antennas, but I’m seeing $200 L1/L2 GPS/GLONASS antennas popping pretty often these days (eBay, AliExpress, etc). Do you need a choke-ring antenna for your application? 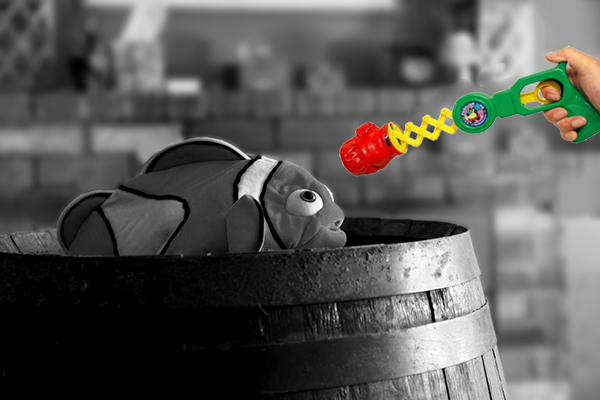 If you get quotes/suppliers for L1/L2 choke rings, please let us know what you find out. Dear Nick, good to read your feedback here and for sure your company head (TERSUS) will have to adopt a much clear attitude. M8P of u-Blox is definitively L1 single frequency chipset. Adding multi-frequency capacity and you will see the pricing changing significantly. 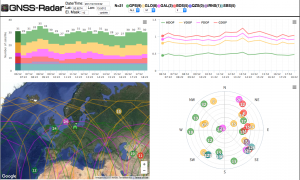 RTCM from CORS or GNSS Network is distributing L1/L2 and all the other signals but your M8P will only digest L1. The reason why it’s worth to investigate RTK L1 is because we are tracking at least GPS and GLONASS. When we had only GPS, to double the observations, we used both frequencies. Now we are “doubling” the number of measurements with 2 constellations. Also thanks to Virtual Reference Station technique (VRS is trademark by Trimble … but it has been invented by Wanninger from Hannover) the reference station is generated on your navigated position that makes the baseline very short ! Dual frequencies can still be justified if your ionosphere turbulences level is pretty chaotic (which is happening on low latitude zones) or you want to perform long range RTK. We tested the u-blox chipset years ago (2008) and connected the eval kit to SpiderNET software to get decent results in real time. Nothing new under the sun. The only problem was half-cycle slips issue that were happening when new satellites were rising a low elevation. Don’t know if they fix it ? Anyway, u-blox as Swiss company is very cautious to introduce their chipsets saying it is made for hobbyists … Professionals (like surveyors) will not triple checks their positions and will not wait minutes and hours to get a fix. Robustness is the key. And this is where ComNav Technology is the game changer and will keep the lead ! Have fun ! Thanks again for sharing your experience. Question: do you have any experience and/or thoughts on the Unicore boards? Nice blog post. My wife is also good at pretending she has interest in this stuff. But only after I asked her to play along. I have no experience with them. A bit more expensive than the ComNav by looks of it. Not sure of status of those pull requests as Emlid does not really share their roadmap etc. Overall, I think Reach is a good product for the price with a good community, but lack of roadmap, list of known bugs and other measures of transparency hampers my further use. I haven’t used North — unsure of the business case for their product considering they’re twice the price of K501G. I wouldn’t be surprised to see Emlid moving away from Reach in the future. Reach created a market for $250 L1 RTK; but now that u-blox has jumped in with a superior offering (the M8P), I don’t know of any reason to wrangle together Intel Edison (discontinued), M8T and RTKLib in a commercial product. If you think about the scant margins that Emlid was clearing on the Reach, I’m sure they’re thrilled to have landed in a much more frothy market with the Reach RS. It’s difficult to overstate how impressive Emlid’s accomplishments have been — I remember reading a couple of years ago they had 3 or 4 employees — of course that number has now grown considerably. When you look at their products, it’s clear they’ve refined the art of pulling together best-of-breed software/hardware offerings into one cohesive product. They don’t re-invent the wheel. All the more impressive is that they do this from a less-than-ideal geopolitical base. I don’t know of any product that can hang with either of those guys in terms of price/performance. Without your Hackers Guide showing how to ditch the dev kit (too big for most small robots) I would have said the ComNav unit was not usable for anyone without resources to spin a SWaP’d carrier. Nice save with that bit of info. Will add the ComNav unit to the wishlist. Congratulations for the great content. I am also doing some testing with the NV08C-RTK from NVS GNSS and the M8P from u-blox after poor success with RTKLIB. Just let me comment on the fact that as a French guy living in Germany, I do not see Latvia, where Emlid is established, as “a less-than-ideal geopolitical base”. Latvia has been part of the EU since 2004 and they have had the Euro since 2014! The fact that the UK may be leaving is not a real issues in my eyes for the stability of the EU. This does not impact the congratulations that they deserve for their great work to democratize RTK. Thanks for correcting my assumption that Emlid is based in Russia. May the good land of Latvia continue to produce such impressive little companies. Thank you very much for your factual analysis. Iam a gold miner based in southern afrika. Kindly advise me whether I can use 3D based mineral exploration software installed on my tablet PC as a rover and connect to base station to do subsurface imaging for mineral exploration. I witnessed someone who used a tablet PC with mineral exploration software to do subsurface imaging of the ground but he used internet data to do the exploration. kindly advise how this can be arranged. It’s good to hear from South Africa! Must apologize that I don’t have any experience with the kind of mineral exploration project that you’re speaking of. Between this article and the discussion on diydrones (http://diydrones.com/forum/topics/don-t-be-ripped-off-buying-rtk-gps) and rplstoday (https://rplstoday.com/community/threads/finally-spilling-the-beans-on-rtk-gnss.330472) you’ve probably saved me a couple weeks of research! According to https://www.ngs.noaa.gov/CORS_Map/ there is a CORS station less than 5mi from my house in Massachusetts, and according to MASDOT, they make their CORS “available for public use”. From what I’ve read, I should be able to (somehow, magically over the internet) get real-time corrections from this and other stations, eliminating the need for my own base station. Is that roughly correct, and could I expect cm accuracy if I am within 10Km of a CORS station (under ideal conditions)? 5) Drotek NEO-M8P Kit ($790 – https://drotek.com/shop/en/home/843-rtk-gps-kit-for-pixhawk.html) – How does this compare to Emlid's kit? P.S. I have a side question: If you're planning on setting up a base station somewhere on the lawn anyway, have you considered using Robotic Total Stations (another type of expensive but precise surveying technology) for localization? 1. Here’s an analysis of differential age effect on RTK position. The old rule of thumb was that you wanted corrections less than 1 minute old. Ideally, you’d like to pull in 1 correction per second. Some of the new receivers claim to be able to provide an accurate RTK position for several minutes without corrections. I have not tested these. 2. UHF is popular because the radios are cheap (~20 USD for a pair on eBay) and their range is pretty strong (often >1km with clear LOS). LORA radios have been receiving a lot more attention over the past few years as they offer even greater range. 3. Assuming that your local reference station provides GPS/GLONASS corrections, you are definitely close enough at 5 miles. If you go for an M8P (recommended for a newbie on a budget), you’ll find that the u-blox u-center software allows you to specify the URI of a correction provider. If you’re looking for an L1/L2 solution like the ComNav, you’ll find that the ComNav Compass Receiver Utility software allows you to specify a correction URI as well (we document configuring the K501G in this post). 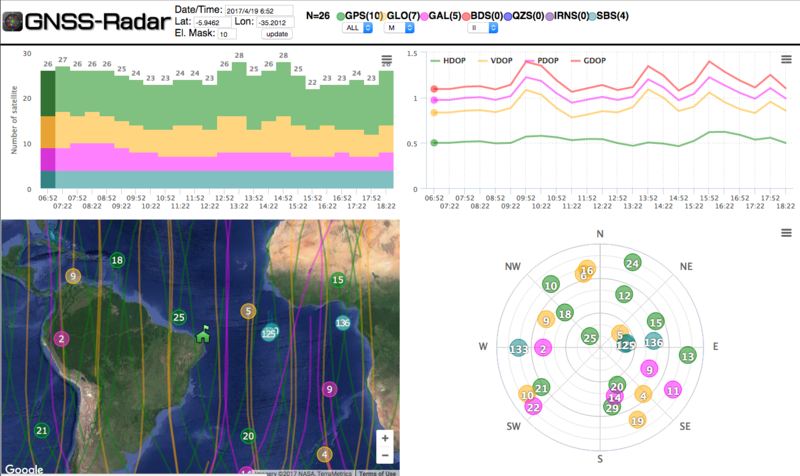 Same goes for the Emlid Reach, and any legit RTK card, for that matter. 4. At 399 USD, the M8P eval kit is an industry changing option. That kit includes 2 M8P evaluation modules with integrated radios. Also included are cheap/effective antennas with ground planes. The instructions for setting up base/rover are clear and easy to follow. I’ve indicated before that I wrote the article above before I had tested an M8P with the latest firmware (v4 as of August 2017) — the M8P is a solid performer and it puts pricing pressure on ComNav in the same way that ComNav pressured Trimble/Novatel/et al. Good luck with your project. Once you score a legit RTK system, I think you’re going to be hooked. I ended up going with the Navio2 (with U-Blox NEO-M8N) plus the U-Blox C94-M8P kits (Which I plan to use as an alternate Rover receiver and/or base station if I can’t get CORS corrections working suitable with the Navio2 and it’s M8N). So far I’ve registered with my local CORS and have an IP address for their NTRIP. 1) U-Blox u-center “Differential GNNS Interface” feature to inject corrections. 2) Use the “RTK/GPS Inject” feature of Mission Planner. 3) Run RTKLib on the RasPi and specify the corrections server there. Thanks for the awesome initial report, and extremely helpful reply to each post since then. I am recently spinning up on RTK, having dived deep into Pix4D on Phantom 4 Pro the past two months. I am now switching to fixed wing (MyTwinDream) based on Arduplane 3.8, and am on the fence about which RTL vendor to select. Reach seems like the greatest community of similar users, and a fairly well worn path. uBlox sounds very interesting as well, though I don’t want to spend the rest of my life integrating great building blocks. My end goal is good topos and orthomosaics for land planning and construction. All images taken from the air, so your ground obstacles are not my challenge. Some projects are in Mexico, where local correction stations unknown or non-existent. A week ago I was leaning Reach RS + air unit. Now I am thinking air unit only, and post processing. I don’t need precise realtime position, just precise results at the end of Pix4D => QGIS. Suggestions? Not afraid to solder, compile, adapt, etc., just like the comfort of multiple similar users so I keep trail-blazing to a minimum. My experience is almost entirely with terrestrial vehicles — can’t really offer expertise with drones. 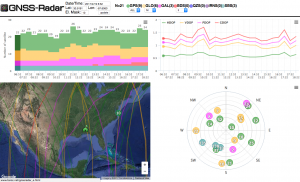 I’ve anecdotally heard several folks use the Emlid Reach in drones with success (you’ve probably seen this article). Completely understand your desire to avoid integrating great building blocks — this can absolutely prove to be a black hole. Have you considered the L1/L2 RTK solution offered by DJI ? Common knowledge seems to be that DJI is the Apple of drones (superior hardware/software, vertically integrated supply chain, etc), so I would be assume their RTK offering may be the absolute best you can get without having to piece together components (and at 4599 USD (Aug 23, 2017) for the complete system, it’s quite affordable for L1/L2 RTK). Im about to buy a RTK. And im confused what to buy between Horizon Kronos C3 and High-Target V90..
I’m not familiar with either of those survey units. Apologies for not being more help. Nice M8P write up! Re: your comments on baseline length: I’ve heard rumors that u-blox is working on an L1/L2 system — release date / status presently unknown. 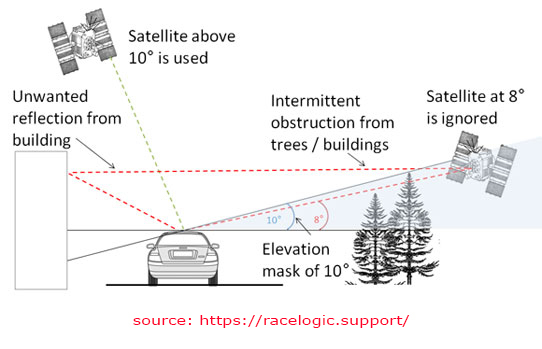 I found this fascinating and the replies you got from surveyors here – https://rplstoday.com/community/threads/finally-spilling-the-beans-on-rtk-gnss.330472/ . I’m not a surveyor but have been looking at getting a Reach RS to take some x,y,z points I need to better than decimeter accuracy. You clearly are a big fan of the K501G. Do you know if anyone bundles it in a base/rover setup like the Reach RS? Glad you stopped by. ComNav sells surveyor products like the Reach (with integrated antenna, interface, enclosure, etc), but I would expect the price to be significantly more expensive. I’m interested to hear a review of the Reach RS — anecdotally it seems that users are quite pleased. 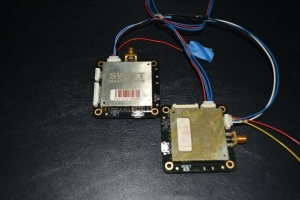 have you been heard about North RTK receiver (L1/L2 board) ? Is it good stuff ? Otherwise, is it possible to do PPK without a base, only with CORS correction post-processing ? I would like to obtain a decimeter precision with an UAV. I’ve heard North is legit — but the price is ~2k USD per card (October 2017) — I’m not sure why you’d go that route over ComNav. You should be able to do PPK if you’re close enough to any CORS base (say 10km-15km for L1 and 30km-50km for L1/L2). You’ve likely noticed that RTKLibExplorer has been writing about PPK lately — definitely worth a read. thanks for iniciating such a useful discussion, I’m amazed of the knowledge you’ve got. Please can I get an advise, what to buy for following purposse? Location: Queenstown, New Zealand. Not many buildings over 3-4 stories. Some mountains around. Pretty good I would say. Budget: Around $1000 would be nice, up to $2000 max, but rather spend a bit more for reliable solution than save a few bucks and spending expensive time fixing it afterwards. We need almost plug&play solution, including software and support for the Collector for GIS app. 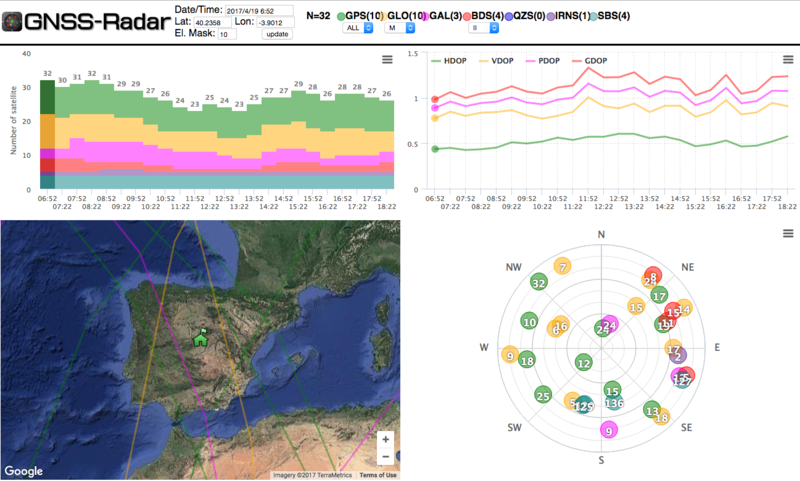 Emlid Reach RS+RTK kit (https://emlid.com/shop/reach-mapping-kit/) was our favourite but now as I can read it is only L1 solution I’m hesitating and considering any L1/L2 solution. Is there any comparable to Emlid L1/L2 plug&play solutoin? Maybe the ComNav? Is it really important to have L1/L2 for my application and conditions. Quite important is to don’t battle to get fix, does L2 help a lot for this? Thank you so much and appologize for maybe silly questions, I’m an newbie in GNSS. I also found a Trimble OEM products, but I guess the pricess would be just similar to Trimble products? Glad to hear from the beautiful land of New Zealand! The surveyors would be able to address your surveying questions much more thoroughly than a humble robot builder / programmer. For your application, the processing software’s ease of use / documentation / support network is going to be a huge factor. I’d suspect (as you pointed out) that paying a few extra dollars for a solution with software that other people actively use may prove to pay considerable time dividends going forward. Thanks Roby for your answer. Thanks for sharing those quotes on the survey equipment. Not being a surveyor, I wouldn’t know which is best suited for your application. Whichever route you go, I’d love to hear your feedback / experience after you use them. I’m using the CommNav gear and I’m in Dunedin. Drop me a line at luke a reid.org.nz and I might be able to help. I’m doing PPP post processing. Roby, I just discovered your blog but it seems you’ve gone on hiatus. Can we expect more updates on your projects? I am a surveyor based in Zimbabwe. I am into equipment sales and hire. I have been fascinated by your article. from your experience who Chinese companies would you recommend that I can deal with. My RTK experience is from the robotics side, so I can’t really speak to the needs of a surveyor. I have been looking at different RTK systems for Agricultural Autosteer using BrianTee’s free open source software AgOpenGPS. I have finally settled on either a Comnav or Unicore OEM board preferable with GPS/Beidou/Glonass as I’m in Southern Australia. Did you ever get and feedback from anyone regarding the performance of the Unicore boards? Also I believable your Comnav contact is Andy Yin, who was your contact with Unicore? Good to hear from you — Australia is out front in innovation in the open source autopilot world — I want to make a trip down under at some point. I’ve never heard independent feedback from using the Unicore board. Also, I don’t recall my contact’s name with Unicore — and don’t think it would help as I never placed an order with them. If you hear anything about their boards, I’d appreciate if you’d pass that info along. Hi Roby – have you basically tired out many different company’s GNSS OEM receiver board? I’d like to listen into your user experience. Thanks. What a great article! I haven’t found this much (of exactly what I needed) information in one place online yet! I’ve been watching Emlid and their Reach for a little over a year, and while they’re popular internationally, I still haven’t found much use in the U.S. by surveyors. I did find online about a year ago that the DNR is going to begin testing with the Reach… haven’t been able to find that article again though! We use a Trimble TSC3 Collector with a Trimble 5800 GPS only receiver, which is over 10 years old. I’ve been interested in getting a new Reach RS +, but want it to connect to our field data collectors which have Trimble Access on them, we use them for our total stations, and GPS work. Emlid has gotten back to me recently with “Unfortunately, we haven’t performed any tests with Trimble Access. However, Reach RS works fine with SurvCe, Topcon MAGNET Field, and FieldGenius”. Still, I can’t believe there’s no surveyor out there who’s connected a Reach RS to a Trimble Access controller. Also, here we connect to an NTRIP DOT network for corrections via wifi from the controller not the receiver. Haven’t quite figured out that process out with the rover/controller setup yet either. Hopefully someone knows about rigging this setup up! I have used Topcon gnss receivers and they are good (both L1only RTK & L1/L2 RTK). The price is reasonable as well when compared to the others i.e. likes of trimble, novatel etc, but not as cheap as emlid..
Hi John — What are the prices you’re seeing for Topcon L1/L2? Hey folks – what is the status of this project? I own a growing portfolio of commercial portfolio in Wisconsin and have been searching for a large scale, autonomous, “no guide wire” robot – and have seen only the Ambroglio for $20K USD+ and it isn’t even sold here. I really do not want to drop $50-$100K on a fleet of Husqvarna 450X’s but the ROI is there and I don’t see an alternative. For now you still have to shell out a lot of money to solve your problem. Autonomous robots are like personal computers in the late ’70s — robots are barely born. Many of us who are using Ardupilot believe we’re effectively seeing Xerox PARC a la Gates and Jobs. Hi, Roby. Thanks for your post. It contains a lot of valuable information for me, after so much time spent searching for information. I’m doing a final project of the university on outdoor robots for agriculture and as you say there are trees and many more obstacles in the field. Thanks to your information, I believe that I am going to choose a local location network for my project, and make it simpler and cheaper. This company had a kickstarter – and is now planning on shipping in January. The Ardusimple folks are building on top of the u-blox ZED-F9P — the first L1/L2 receiver from u-blox — early indications are that the ZED-F9P upholds the u-blox reputation for overdelivering and basically making new markets with their products. Got my Ardusimple board in the mail this past weekend, looking forward to playing with it this weekend. I agree with David, a write up from Roby would be fantastic! Bob — looking forward to hearing feedback on Ardusimple’s ZED-F9P board. It looks like those guys have delivered on their Kickstarter goals — very impressive turnaround. 2019 is shaping up to be the year that u-blox democratized precision GNSS. David — Ardusimple is first out of the gate for capturing maker mindshare for the ZED-F9P. Now that they’ve delivered on the Kickstarter campaign, they’re definitely a company to watch. I don’t have their board (yet), but hope to fix that soon. thanks for all the precious info. have some of you already tried the alpha rtk receiver (polaris-gnss)? seems promising but i can’t find any independent review. In 2006-2007 I worked for a survey company that was also a Leica agent supplying the mining industry in QLD. Talking to people in Hexagon the take over was primarily about reducing competition and keep prices high. Leica now screwed everyone, even agent like we were. The screens that were fitted for machine guidance could be bought on the open market for half the price that Leica charged, that’s one solid example, I was in the room at the time. For actual survey work in the field we used Topcon bases, Leica were too expensive even for us. In the history of the RTK revolution don’t forget SweetGPS which came before RTKLIB. I did write about all this as it happened in 2009 and the practices of companies supplying survey grade equipment. The reason you can’t read it now it was posted on DIYDrones in the early days, probably under my stuff on the Autonomous Treasure Hunter, a model boat which would have RTKGPS. I removed all that in about 2010 when I became aware that DIYDrones was not all it appeared to be. What made me suspicious about DIYDrones was the opening statement on the site about being civil, for a civil use site it had too much military stuff for me, eg military funded competitions. Mr Anderson got very stroppy when I pointed this out. A writer for the New York was treated quite badly when asking about pilots of military drones, no moderator stepped in. This all made me question what DIYDrones was really about. In my searches I found someone that wrote under the name Shepards Pie. He worked for Microsoft and the NSA and posted what appeared to be a redacted blog, he referred to DIYDrones as the honey pot, government agencies, a place to track people. Well that’s something to think about. I’d like to ask you about Unicorecomm receiver, could you finally test some of them? I’ve got a good quotation for them but I haven’t any reference about them. Do you have a reason to not roll the u-blox ZED-F9P? 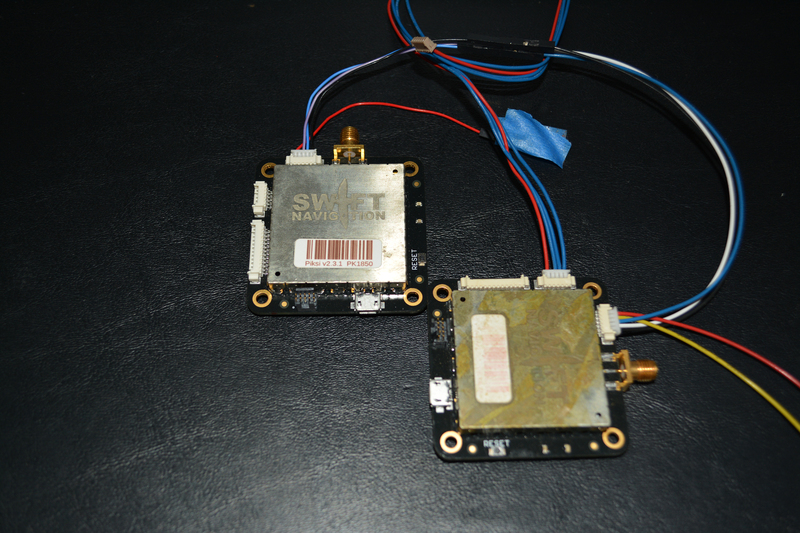 I´ve tested the ublox Z9F. I received corrections from a CORS base at 15Km, it takes a lot of time to get Fix position and it losses very easy. I´m looking for a receiver more robust.